It seems that a lot of the hardback copies of The Survival of the Princes in the Tower are not reaching people after the release on Thursday. I’m told there has been a delay getting copies to the warehouse, but that they are there now and should be shipped early next week. The Kindle version is available if you like your books electronic, but I know the feel of a hard copy book is irreplaceable to many. I’m sorry that there has been this delay in getting copies to you of a book I’m really keen for everyone to read. By way of an apology, I’m dropping a little extract here from the section dealing with Perkin Warbeck, detailing some of the rising tension in England in 1493-4. I hope you enjoy it until the books begin to drop on doorsteps. The lack of direct action from Margaret’s pretender does not mean that concern in England was not reaching a thinly veiled peak. 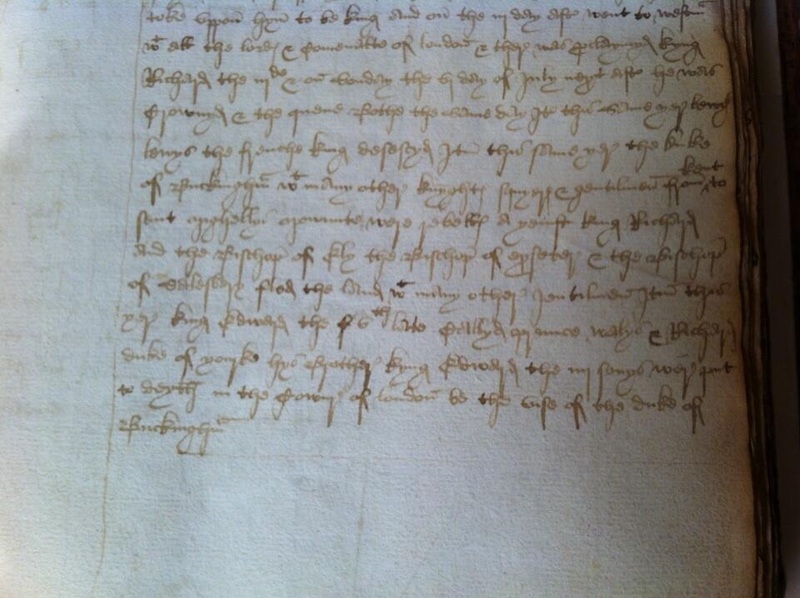 On 20 July 1493, Henry VII wrote a letter recorded in Ellis’s Original Letters Vol I to Sir Gilbert Talbot and expressly blamed Margaret for instigating the problems he now faced and tried to dismiss her prince as a ‘boy’, but it also ordered Talbot to be ‘ready to come upon a day’s warning for to do us service of war’ against the threatened invasion of ‘certain aliens, captains of strange nations’. It was all very well for Henry to call this pretender a mere ‘boy’, but Richard, Duke of York would have been nineteen years old by this point, an age at which his father was leading armies and devouring enemies, not only at the Battle of Mortimer’s Cross but at the cataclysmic Battle of Towton, the largest battle fought on English soil, which Edward IV won to cement his own position on the throne. Henry would have been all too aware of this so his flippant disregard can only have been a blustering front. Ellis’s Original Letters Vol II offers further illumination of the concern Henry felt, but needed desperately to hide. This document is a set of instructions given to Clarenceux King of Arms for an embassy to Charles VIII in France. The current holder of the office of Clarenceux King of Arms on 10 August 1494, when these papers were signed by Henry VII at Sheen Palace, was Roger Machado, who had been appointed to the role on 24 January that year. Roger Machado was of Portuguese extraction, which may be important to the tale, and had served Edward IV as Leicester Herald and appears, during the early part of 1485, to have undertaken several journeys on behalf of Thomas Grey, Marquis of Dorset, which may have been in relation to Henry Tudor, then in exile and planning his attack, or might equally have related to one or more of Thomas’s half-brothers, the Princes in the Tower, in hiding abroad. Here we have Henry’s riposte to Richard’s pretension; the king claims that the youth is a native of Tournay, the son of a boatman and that his true name is Werbec, though it is unclear whether this is offered as the imposter’s forename or the family name of his father. Henry asserts that he has a wealth of creditable information confirming this and that Maximilian knows he is supporting an imposter, rather than a genuine pretender. This accusation is important for the very reason Henry points out. It should be considered beneath a prince of any nation to undermine the authority innate in royalty by holding up a known impostor, and a commoner from a foreign land to boot, against a fellow prince, whatever their personal quarrels may be. Supporting a legitimate potential alternative was fair game and an important political tool, but to cause a common man to be treated as royalty, allowed to wear royal cloth of gold and be hailed as a rightful king was not something any prince should, or would, do lightly, not least for the harm it would do to their own exalted position. From the descriptions provided earlier, Maximilian does not seem likely to take such an unwise step simply to help the step-mother of his deceased wife keep a personal feud alive. 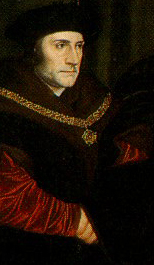 It is possible that Maximilian took the inadvisable step as an expedient to keep Margaret onside and harness her popularity in Burgundy for his son’s benefit, or that he turned a blind eye to the possibility that Richard was not Margaret’s nephew, at least not the one he claimed to be. One explanation for the family likeness is that this Richard was an illegitimate son of Edward IV, though a child from Edward’s exile in Burgundy in 1470-1 would appear too old and one fathered during his 1475 invasion of France too young to pass off as Richard, Duke of York, born in 1473. 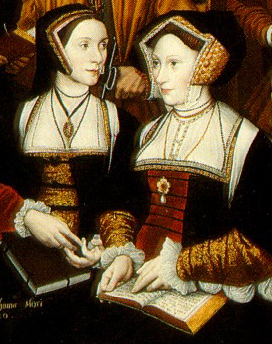 It is possible that another illegitimate child was sent to Margaret to be raised in comfort, away from the glare of Elizabeth Woodville, and that Margaret now saw in him the perfect chance, but such an illegitimate child is undocumented and no contemporary is recorded to have made such a suggestion. Henry went on to offer his mediation in the dispute over Naples, since he and Charles VIII were now firm friends and the King of Naples was also on good terms with Henry, being a knight of the English Order of the Garter. Machado was, if asked about the state of domestic affairs, to assure Charles that England was more peaceful now than at any time in living memory, though Ireland remained something of a lost sheep that the king was resolved to bring back into the fold. In this way, any further input from Ireland into current problems could be written off as typical Irish troublemaking. Henry expressed his intention to send an army to quell the ‘Wild Irish’ and bring firmer order back to the Pale, where the English writ at least nominally ran. The last instruction to Machado was to thank the King of France for his assurance that if the King of Scotland were to launch an attack on England, Charles would neither condone nor offer any support to the action. A separate instruction was added to the end, after the main set had been signed, giving Machado authority to show evidence to the King of France that Maximilian knew the pretender he supported was a fake and that his sole motive was anger at the peace now being enjoyed between England and France. Henry expressed a firm belief that he could reach terms with Maximilian if he wished to, but said that he would not for as long as Maximilian continued on his present course, trusting that England and France together could comfortably overcome any storm opposition to the Holy Roman Emperor might bring their way. Early the following year, Machado, having returned from this embassy, was sent back to France with fresh instruction drawn up at Greenwich on 30 December 1494. Henry reminded Charles that the French king had promised to send an envoy to discuss the state of affairs in both their countries but that none had arrived. Machado was therefore returning to France with news that Henry was in fine health and as beloved by his people as any of his predecessors had ever been. All was well in Ireland, where the men of power had submitted to Henry’s Lieutenant. The final instruction to Machado (who, as well as holding the office of Clarenceux King of Arms was Richmond Herald) was ‘Item, in case that the said brother and cousin of the King, or others about him, should speak at all touching the king of the Romans, and the garçon who is in Flanders, the said Richmond may reply as he did on his former journey. And he shall say, that the King fears them not, because they are in capable of hurting or doing him injury. And it appears each day more and more to every person who the said garçon is, and from what place he came.’ It seems that Machado was briefed with a response to be used only if the matter to the pretender was raised by the King of France or any of his ministers. The response was to be repeated as it had been before; Henry was not afraid, but in sending Machado back so quickly on the pretence of a delay in Charles’ envoy arriving, Henry betrays a strong sense of concern. He protests too much and perhaps wanted a trusted, experienced pair of eyes at the French court again to make sure that Charles was not double-dealing. The constant reference to Richard as a boy smacks of bluster, an attempt to depict smooth confidence where none really existed. All was not, as Henry tried to make out, quiet in England and this second embassy by Machado was in response to shocking events at home. Historical opinion often moves in circles on certain topics. Sometimes it’s a slow process and sometimes it happens quickly. The White Queen series stirred up the latent and under-examined but long-standing theory linking Margaret Beaufort to the disappearance and murder of the Princes in the Tower. In short order, the increased attention drew an onslaught of opinion denouncing the theory as impossible, implausible nonsense. The memes below offer a sample of the abuse drawn by the idea. So is this theory really devoid of merit? Criminal investigations will frequently look for three elements when trying to establish if someone is a suspect; motive, means and opportunity. Richard III is quite rightly attributed with all three, though his precise motive is open to debate. There are other suspects, but if we concentrate on Margaret Beaufort, can any component be reasonably established for her, accepting that beyond a reasonable doubt is outside the realms of current knowledge? Motive is often denied, since removing the Princes left too many other obstacles in her way to be a realistic attempt at getting her son onto the throne. The facts would tend to give the lie to this view though since her son ended up on the throne and as figurehead for a failed invasion in October 1483. At some point between Edward IV’s death in April 1483 and the rebellion of October 1483 the idea of Henry Tudor as a viable alternative to Richard III was birthed and grew. It cannot be considered beyond the bounds of possibility that the thought occurred to his mother early in the tumultuous events of that summer. It is known that Lady Stanley, as she was then, was in the process of negotiating her son’s return to England with Edward IV in talks that included the possibility of marrying him to one of Edward’s daughters (though probably not Elizabeth). A minority government, with all of its inherent insecurity, was unlikely to see those plans followed through for some time and when Richard became king in his nephew’s place there was also no sign of further talks on this matter. Margaret had come so close to securing her son’s return only to have the hope she nurtured snatched away at the last moment. Would she accept that circumstance willingly? It is true that she had endured the separation for years to that point, but having come so close must have made her more desperate for a reunion with Henry. It might have become clear to Margaret that her son was not going to be allowed to return peacefully at any time soon and that an invasion was the only chance of getting him back. The aftermath of Richard III’s assumption of power presented an opportunity that the last ten years of Yorkist security had not for the pursuit of Margaret’s desire to have her son back by reigniting dormant Lancastrian sympathy and marrying it to the portion of Yorkist supporters unwilling to follow Richard III. It perhaps bears consideration that if Richard killed the princes with the motive of securing his position, he failed. If Margaret had it done to further her son’s prospects of a return, she succeeded. That fact proves nothing, of course, but it is food for thought. As to means, this is every bit as contentious as the motive aspect. I have seen it argued that Margaret was a disgraced and punished nobody, married to an unimportant minor nobleman. This is rubbish. Margaret’s property was seized and given to her husband, but only after the October rebellion that aimed to put her son on the throne. A part of the reason that Margaret had been able to make three (if we ignore the first to John de la Pole as she did) good matches was that she was an immensely wealthy woman who controlled, or offered her husband control of, vast estates and income. The reason that she was deprived of her property after the rebellion was precisely that she had funded much of it, sending cash to her son in Brittany and then France. She had the means to orchestrate an invasion from within England, so why would access to the princes be beyond her? Far from being a woman restrained by sanctions, in the summer of 1483 Margaret could hardly have been closer to the centre of power. Perhaps Richard III felt the need to court or pacify the Stanleys, because at the joint coronation on 6th July, Margaret carried Queen Anne’s train, walking ahead of Richard’s own sister, the Duchess of Suffolk. Her husband, Thomas, Lord Stanley walked only a couple of places behind the king, bearing the mace of the Lord High Constable, a great office of state previously held by Richard himself and placed in the hands of the Duke of Buckingham, but which Thomas Stanley would acquire after the October rebellion. Does all of this power and influence translate into the means to secure access to the princes for someone tasked with killing them? The denial of this relies on two more long-standing fallacies. The first is that the princes were thrown into a deep dark dungeon and treated as prisoners. There is simply no evidence of this. They were moved from the royal apartments where Edward V had been preparing for his coronation, as tradition dictated, because those apartments were in turn required for Richard and Anne to prepare for theirs. There is talk in contemporary accounts of them being withdrawn into the castle and seen less and less, but they were seen, exercising, shooting their bows and playing after Richard’s coronation – not languishing in a dank dungeon somewhere. Their servants were removed and replaced, most likely not because those servants were loyal to Edward V but to the Woodvilles, particularly Anthony, who Richard had arrested for treason and whose sister, the dowager queen, had fled into sanctuary and was refusing to talk to the government, even before Richard was asked to take the throne. None of this would necessarily prevent access to them being secured by a woman so close to the court that she had just carried the queen’s train at the coronation and not associated with the Woodvilles. The other great misconception is that the Tower of London was a locked and bolted prison, a dark place with a sinister character. That was not true until the Tudor era, when palaces further along the Thames were preferred and the Tower earned its brutal reputation. The Tower was a functioning royal palace, a busy and bustling place where the Royal Treasury was frequently housed, Council meetings held and military provisions stockpiled. There must have been a steady stream of deliveries of food and goods as well as a standing staff to run the Treasury and the other more permanent functions of the Tower so that even when the royal household wasn’t in residence to swell the numbers further, it would hardly have been a deserted place impossible to access, even without the influence then wielded by Lord and Lady Stanley. Opportunity is closely linked to the conditions above. If we accept that the princes were not closely guarded prisoners hidden deep within the bowels of the Tower, that in the summer of 1483 Lord and Lady Stanley were riding high in royal favour and were yet to attract suspicion and that access to the Tower, whilst perhaps not wide open to every resident of London, was not impossible in a working palace with regular comings and goings for people of such influence as Lady Stanley, then opportunity becomes easy to establish. There is a clear indicator that Margaret Beaufort’s work on her son’s behalf in the late summer of 1483 was advanced, ran deep, was secret and relied on the death of the Princes in the Tower. It was Margaret who opened up a clandestine line of communication to Elizabeth Woodville in sanctuary at Westminster Abbey. Margaret used her physician Lewis Caerleon, who posed as Elizabeth’s physician, to pass messages between the two women. That is how Margaret secured Elizabeth’s agreement that their children should marry and together they should promote Henry Tudor’s prospects of taking the throne. For Elizabeth to agree to this, she must have believed her sons were dead and their cause lost, so that marrying her daughter to Henry Tudor represented the only course open to her out of sanctuary and back to power. Given that no one, contemporary or otherwise, knows for certain the fate of the Princes in the Tower, how could Elizabeth, from the isolated seclusion of sanctuary, have got news so definite that she gave up on her sons? The obvious answer is from Margaret Beaufort, via Dr Caerleon. If it was part of her plan to pass this story to Elizabeth to improve her son’s cause, then their murder was part of her thinking and she just might have planned to organise it too. I don’t know that Margaret Beaufort was involved in the fate of the Princes in the Tower, but it is clear that she exploited the idea of their murder to further her son’s cause. Buckingham is as strong a suspect and Richard III must remain prime suspect (if we believe there was a murder at all, which is another matter). My point here is that all of those who sneer at the notion that Margaret Beaufort could have been involved are, in my opinion, wrong. Margaret had motive, means and opportunity, and that makes her a suspect. Before I begin, I have two words of warning. The first is that a huge spoiler for my novels Loyalty and the sequel Honour unavoidably follows. Just so that you know! 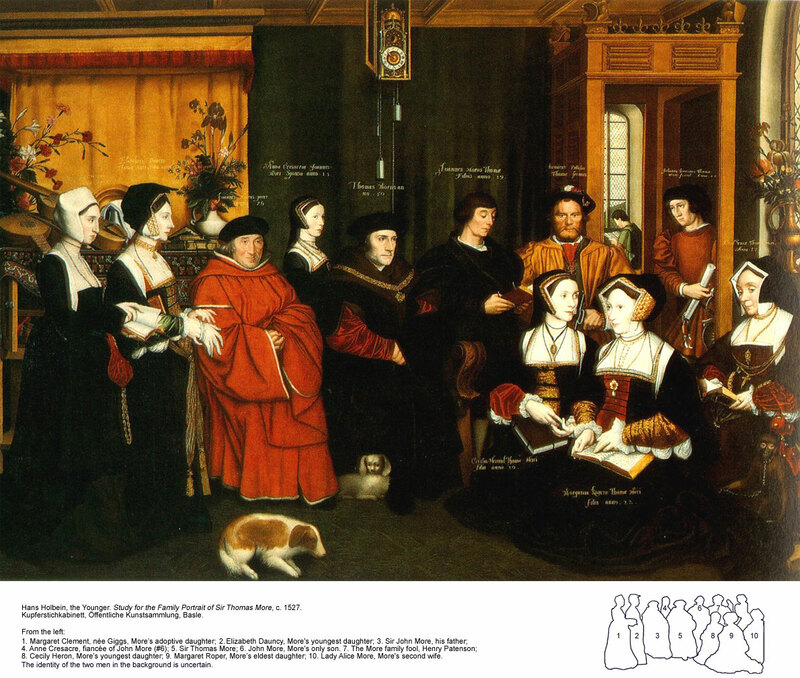 Secondly, the following is my telling of the theory researched and expounded by Jack Leslau, an amateur art enthusiast who believed that he stumbled across the answer to the riddle of the Princes in the Tower hidden in Hans Holbein’s stunning portrait of Sir Thomas More’s family. I am not seeking any credit for the facts and ideas below and am relying upon Jack Leslau’s work entirely. Since he passed away, his theory seems to have sat somewhat unattended. I have tried to make contact using the details on the website (that still exists, but is extremely hard to read) to no avail. I am not aware that this work is for sale anywhere and do not intend to breach any copyright. If I do so inadvertently, I am sorry and will remove this as soon as I am made aware of such an infringement. My reason for writing this is threefold. Firstly, I was fascinated a long time ago by the compelling nature and originality of Jack Leslau’s work. Secondly, in no small part it inspired my novel, Loyalty, for which I owe the late Mr Leslau a debt. Finally, this work is becoming less and less accessible and I find this a great shame. I do not say that what follows is an indisputable truth. Much of Leslau’s theory can be, and frequently is, contended. Perhaps you will find it interesting, even compelling. In the absence of other evidence, it certainly bears some consideration. Richard III is so frequently condemned on hearsay and supposition, I think this might offer an alternate reading of events worthy of contemplation. I hope that you will join me for this fight of fancy. There is no quick way to impart this detail, I’m afraid, so strap in, and if you are sitting comfortably…..
Sir Thomas More was one of the most influential men in Henry VIII’s England in the 1520’s. A close friend to the king, this lawyer’s star was on the ascendant when artist Hans Holbein arrived in England. 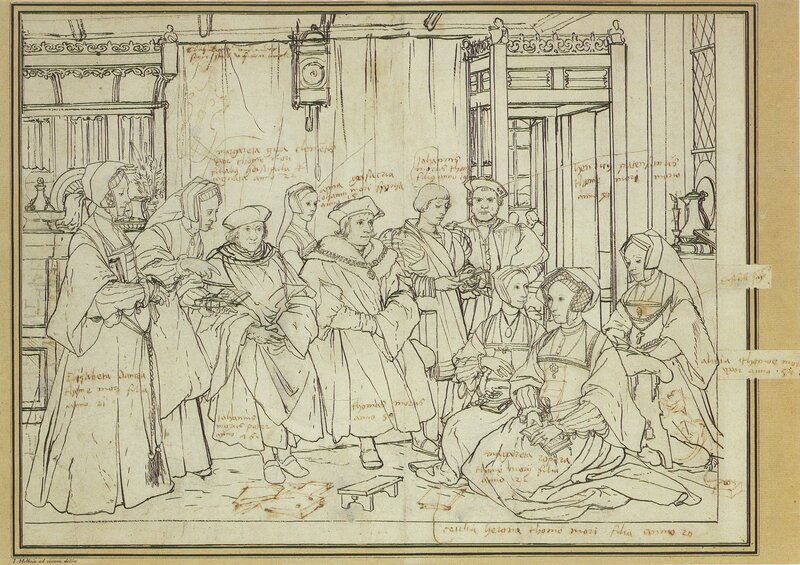 Probably in 1527, Holbein was commissioned to execute a group family portrait for Sir Thomas. He made a sketch, which he probably took back to the Continent with him to translate into the final painting. 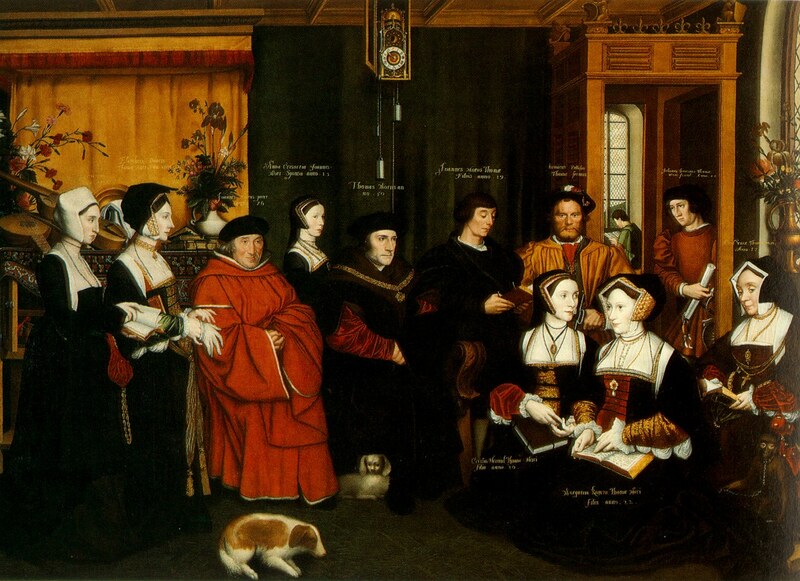 The painting includes Sir Thomas, his son, his daughters, including his adopted daughter, his second wife and his late father. There are also a few other figures who may not attract the eye, but it is upon one of these figures that Jack Leslau built his fascinating theory. 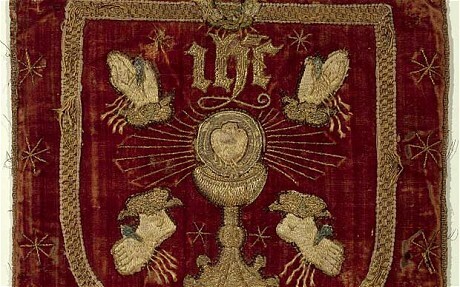 The figure toward the right at the back marked as ‘Johanes heresius Thomae Mori famul: Anno 27‘ has long been believed to represent John Harris, Sir Thomas More’s long standing secretary. Leslau, however, uncovered several interesting anomalies that he believed pointed to a different occupant for this position, and the unravelling of England’s greatest mystery. Leslau believed that this figure was, in fact, Dr John Clement, the husband of Margaret Giggs, Sir Thomas More’s adopted daughter, and, more controversially, that Dr John Clement was the assumed identity of Richard of Shrewsbury, Duke of York, the younger of the Princes in the Tower. ‘John’ – Is this Richard, Duke of York? Let us begin with what is known of Dr John Clement. His date of birth is uncertain and a matter of debate. He is widely believed to be the ‘puer meus’ of Sir Thomas More’s seminal political tract Utopia. This led many to believe that he had been born around 1500, which would be consistent with the age offered for ‘Johanes heresius’ of 27. It is believed that Clement attended St Paul’s School under the tutelage of William Lily, though Leslau was unable to find evidence of this. Clement is first recorded in More’s household in 1514 and he may have gone with More on his 1515 embassy to Bruges and Antwerp. It was in More’s household that Clement met his future wife, Margaret Giggs, Sir Thomas’s adopted daughter. She was born around 1508 and they married in 1530. At some time between 1518 and 1519, Clement was appointed as Cardinal Wolsey’s reader of rhetoric at Corpus Christi College, the foundation of Bishop Richard Foxe that was dedicated to humanist study. Clement later became a reader of Greek at Oxford before leaving there during the 1520’s to study medicine in Italy. It is known that Clement travelled via Louvain and Basel, where he met Erasmus, and that he delivered a copy of Utopia to Leonico at Padua in 1524. By March 1525 he had received his MD from Siena. On his subsequent return to England, Clement aided his successor at Oxford, Lupset, in completing the Aldine edition of Galen and later in 1525 he appears in the royal accounts as a Sewer (Server) of the Chamber in the Royal Household, as he did again in 1526. On 1st February 1527 or 1528, Clement was admitted to the Royal College of Physicians and in 1529 was sent, along with two other physicians, under Dr Butts to treat the ailing Cardinal Wolsey following his fall from grace. In 1535, Dr Clement was consulted on the treatment of John Fisher’s liver during his imprisonment in the Tower. 1538 saw him granted a semi-annual income of £10.00 from the royal household, though this appears to have been cancelled in 1539. In 1544, Clement was made President of the College of Physicians and Leslau discovered, and confirmed, that Clement is unique amongst the long history of Presidents of the College of Physicians in that no copy of his signature exists in the possession of the College, nor any record of his origin or background. Every single other President has a preserved copy of their signature. This may, of course, be coincidence, but it set Jack Leslau along an interesting road. There is more of Clement’s story to come, but perhaps we should return our attention now to the painting and some of the anomalies that Leslau uncovered, along with the meaning that he attributed to them. Jack Leslau became fascinated by Sir Thomas More’s involvement in the story of King Richard III and the Princes in the Tower. Why, he asked, would a man as learned and respected as More, a lawyer and theologian, lend his name and reputation to the collection of inaccuracies and rumours that comprise his Historie of King Richard III? If the Princes were murdered, why did no-one, including even their own mother, ever raise hue and cry or point the finger at King Richard after his death? Leslau believed that Holbein’s portrait unlocked this mystery. Jack Leslau compared Holbein’s preparatory sketch, made around 1527, with the post-1532 portrait and found 1 major and 80 minor changes, each of which was relevant to the ‘hidden secret’ he believed was contained in the painting. The major change was the addition of the controversial figure in the doorway, who was omitted from the sketch. There are several interesting and compelling anomalies that revolve around this figure. The first thing to consider is the writing above his head that identifies the man, which is more cryptic than at first appears. It reads ‘Johanes heresius Thomae Mori famul: Anno 27“. ‘Johanes heresius‘ is usually assumed to refer to John Harris, yet if ‘heresius‘ is intended to equate to ‘Harris’ then it is the only surname in the painting that is not designated by a capital letter. The word ‘famul‘ has been assumed to be an abbreviation of famulus, meaning secretary, but these two words have possible other meanings. In the Latin vocative, heresius can be translates as heres – heir, ius – right or rightful, so that heresius could translate as rightful heir. Suddenly, we are presented with John, the rightful heir. Secondly, John stands, literally, head and shoulders above the More family. Leslau contends that it was traditional in portraits of this era for the person of highest status in a painting to be placed in the highest position. Infrared photography has been used to prove that the top of John’s hat is the highest of any in the picture. Add to this the fact that above John’s head is a row of fleur-de-lys, the traditional symbol of French royalty. 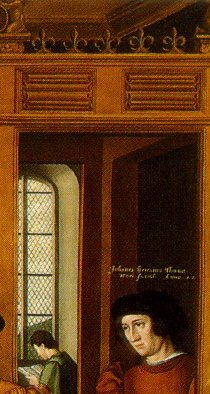 One of Holbein’s famous optical illusions also means that the structure is simply part of the door frame when seen from the right, yet from the left it appears to be a half open door. John therefore stands before a vanishing door, or an impossible door. The figure attracts further intrigue when considering that he is dressed in an Italian style, unlike the English dress of the other sitters, pointing to Clement’s Italian medical training. Not only does he hold a roll of parchment, but he also sports a sword and buckler, extremely odd for a secretary, but the traditional trappings of a warrior, which fits neither secretary nor doctor. One oddly bent finger touches the pommel of his sword and the buckler has a polished rim and spokes. To these anomalies, Leslau applied the principles of French courtly language that Holbein apparently frequently used. The French for optical illusion, as used on the vanishing door, is porte-a-faux, which literally translates as false door, pointing to tricks or hidden falsehoods within the scene. ‘He holds a parchment‘ in French is ‘il tient le parchemin’, which, in courtly French, can mean ‘he holds the right and title of nobility‘. The spoke of a wheel, as seen on the buckler, is ‘rai‘ and the rim is ‘jante‘, which Leslau identified as a split homophone of ‘rejente‘, which translate to regent. Furthermore, Leslau points to the fact that the ceiling timbers are out of alignment at the top of the painting. Applying the same principles to this anomaly, a line fault becomes a faute de ligne or fault de linage, which equates to a fault in the lineage. The sideboard in the background of the picture is covered by a carpet. ‘To hide the sideboard under the carpet‘ in French is ‘cacher la credence sous le tapis‘, with Leslau pointing to the word ‘credence‘ being used in French courtly language to mean ‘confidential matters‘. Are confidential matters being hidden from view in the painting, swept under the carpet? If all of this were true, it points toward the figure named John being of importance; he is marked by fleur-de-lys and occupies the highest station in the painting. Some French courtly language tricks could be used to further mark him as someone demanding closer attention. No secretary would carry a sword and buckler and he is potentially named as a rightful heir. At the centre of the picture, at the top, is a beautiful clock, a symbol of wealth and status at this time. Yet even this clock holds hidden meaning to Leslau. The pendulum is missing, an important factor relating the ceasing of the passing of time which we will revisit later. The clock’s door is open, which suggests that the time has been altered too. This might also have importance to the person of John. The dial has only one hand, which points to the number eleven, perhaps denoting the eleventh hour and also the one remaining prince, a matter we shall also return to in a while. Above the clock face, a solar eclipse is shown. Given that the Sunne in Splendour was the emblem of the Princes’ father, Edward IV, its eclipse is perhaps relevant. Leslau identified that John is perpendicular to the arc of the sun’s corona, a symbol that forms part of the Duke of York’s arms, and suggests that this points to John’s identity as Richard, Duke of York. Jack Leslau also believed that code within the painting identified the recent death of the elder of the Princes in the Tower, Edward V. The curtain at the back is drawn, there is a black eclipse and More appears unshaven, all of which are symbols of death and mourning. At a point in the painting higher than John stands an arrangement of purple and gold flag iris. The colours of these flowers do not exist in nature and are well known symbols of royalty. Leslau even points to the fact that More’s chain of S’s sits off centre, over his heart, and that this forms a perfect right angle from the flowers at the end of the weight on the clock. This left angle is used by Leslau to suggest that the recently deceased royal is ‘left quartered’ in the heart of Thomas More and the royal Duchy of Lancaster. “D’un cote, est-ce (esses) gauche? “On the one hand is it gauche (clumsy, or left)? Is it adroit (clever, or right)? Is this a cunningly constructed reference to More’s attempts to hide the continued existence of the Princes in his outrageously inaccurate story of Richard III? The artist is uncertain whether it was clumsy or clever, suggesting perhaps that only time will tell. Interestingly, Thomas More shows only three fingers, perhaps also a reference to Richard III. Other figures in the portrait also contribute further to Leslau’s theory. The two women sitting toward the front on the right of the picture are identified as Margaret Roper (on the right) and Cecily Heron (on the left), More’s daughters. The book that is open on Margaret Roper’s lap show two pages from Seneca’s Oedipus. Margaret points at the word Oedipus, suggesting a tragedy relating to a king, while beside her, Cecily counts on her fingers. Does she count tragedies? Or kings? Or both? The lines on the opposing page of Oedipus show a speech by Seneca’s Chorus from Act 2, which begins “Fata, si liceat mihi fingere arbito meo“, which translates as “If it were permitted to me to change Fate according to my will…” and the speech continues that he would have things other than they currently are if it were within his power. Does this point to More’s desire to see the House of York restored as the rightful kings? The top of the page on Margaret Roper’s left shows “L. AN. Seneca”, which may refer to Lucius Annaeus Seneca. However, ‘L. AN’ in French is 50 years, More’s age in 1527 and the age shown above his head in the painting. Leslau believed that this suggested the fact that the portrait was not actually painted in 1527 but pointed to events in the More family and household in that year, that this was when the clock was stopped. Two dogs sit on the floor before the family. Sir Thomas More has central placement in the picture. Above him, the clock is central, perhaps marking the importance of its hidden message, and the odd looking dog at More’s feet is also on that central line, marking it as also of some import. Leslau notes that the German for ‘fetch the bone’ is ‘hol bein’, a homophone for Holbein, perhaps marking the strange little dog as a devise representing the artist. If this is the case, then the dog’s cocked left ear suggests that some news has reached Holbein’s ear, perhaps even that he is like a dog with as bone. The lady at the far left of the portrait also requires our attention. She is Margaret Clement, nee Giggs, wife of Dr John Clement. I would point out the since John and Margaret apparently did not marry until 1530 yet the portrait is ‘set’ in 1527, marking her as Mrs Clement at this point seems significant. Margaret is placed on the far left, on the outskirts of the family, left on the fringe, and wears a cheap rabbit skin hat, whereas the other ladies wear expensive headdresses. She is also painted unflatteringly, which Leslau suggests points to the artist taking a dislike to her for some reason. Her finger is pushed into the spine of a book – in French, ‘le doigt dans l’epine‘ can also mean ‘she keeps going on at him’, suggesting disharmony between John and Margaret. This is further supported by the lute behind her, pointing to her back, since ‘lutte‘ is French for ‘to fight’. The vase behind her, ‘vase d’election‘ (‘the chosen one’), is covered – ‘la vase est covert’ in courtly French means ‘the Chosen One is justified’, perhaps suggesting that Holbein believed John Clement to be in the right in whatever arguments they engaged in. Margaret’s book is blank, perhaps suggesting that they argue over nothing, or even that she is unaware of the secret of the painting, that she does not know who her husband really is. The placement of an untidy flower arrangement behind Margaret points to an untidy arrangement – perhaps her marriage to Clement – and includes purple peony, a flower with double significance which will be further examined shortly. Although Leslau describes several other anomalies, some do not relate directly to the identity of John Clement and I am already conscious of the length of this blog. With much still to say, I am skipping some of these items. I will just point out the man at the far rear of the painting, apparently outside on a balcony. He is reading and has the short hair of a monk, though he is missing the tonsure, the shaved bald spot. ‘Hair is there‘, Leslau suggests, is a homophone for ‘Harris there‘. John Harris, More’s secretary, is included for good measure. These entries are 62 years apart. Could they refer to the same person? If so, Clement was clearly born before 1500. Interestingly, Richard, Duke of York was born in 1473, so would have been approaching his 16th birthday at the time of the first entry in 1489. This age would be consistent with the correct age for university enrolment at this time. The second entry records John Clement as both a ‘Lord’ and as ‘of noble birth’. No noble Clement family existed in England at this time, so the entry is either wildly inaccurate or was made in the knowledge that John Clement was the assumed identity of an English nobleman. The bracketed note after the entry is also interesting. John Clement had not ‘sworn the oath’, as he had not in the 1489 entry, though this time a reason is offered; ‘for a reasonable hidden cause’. Leslau’s research discovered that such an explanation is unique between the periods 31st August 1485 and February 1569, a period during which 49,246 entries were made. If Clement was, indeed, using an assumed identity, then swearing the oath under a false name would have been perjury. The fact that the University may have lost its right to the privilegium tractus in such an event might explain the acceptance of the failure to swear, whilst simultaneously implying that the University was aware that Clement was living under an assumed identity, and doing so for an acceptable reason – at least implying no fraud. Of the ten participants (beside the king, Henry VIII), five (Lord Howard, Thomas Knyvet/Knevet, Henry Bourchier Earl of Essex, William Courtenay Earl of Devonshire and Arthur Plantagenet) were close relatives to the king either by blood or marriage. Additionally, Charles Brandon was probably Henry’s closest friend and would later become his brother in law and Duke of Suffolk. Leslau points to this as evidence that Clement could not possibly have been born in 1500, since he would only have been 10 years of age at the time. I would also add that it creates the significant possibility, if this set of challenges was filled with Henry’s closest friends and family, that Clement was amongst that elite set and that he held his position there because Henry knew who he really was. Was Clement’s true identity an open secret amongst Tudor England’s ruling class? At least in Henry VIII’s youth, while he brimmed with confidence. Dudley’s intercession is of interest because Leslau contends that Edward V survived as Sir Edward Guildford, who happens to be John Dudley’s father in law. Dudley is also clearly under the impression that “some great men” will take interest in Clement’s case. Clement’s later life is also interesting, and some portions are relevant to this discussion. In 1549, as Edward VI’s Protestant rule became established, Clement and his wife quit England for Louvain. Although he returned during Queen Mary’s reign, Clement was unable to regain the extensive 180 book library he had lost when he left. The motive for this departure and return is not hard to discern. The Public Record Office in Chancery Lane holds an inventory of Clement’s Marshfoot house, showing property seized by Sir Anthony Wingfield with the approval of Sir William Cecil, the future Lord Burghley. The Chapel Chamber contained many Catholic artefacts, including “an awlter, a picture of our Lady, a picture of the V woundes” (the sign of the five wounds featured prominently as the badge of the popular uprising against Henry VIII, the Pilgrimage of Grace). On the accession of Queen Elizabeth I, Clement left England for the last time in 1558. In March 1562, an entry appears in the Louvain register for “Dominus Joannes Clemens, nobilis, Anglus” and he appears for a final time in the register in 1568: “Dominus Joannes Clement in theologia“. In total, these entries span an incredible 79 years. John Clement died on 1st July 1572, two years after his wife of some 40 years. In a final significant act, he was laid to rest near the high altar of St Rombout’s Cathedral in Mechelen, a spot traditionally reserved for members of the House of Burgundy, Margaret of York’s family by marriage. If he was Richard, Duke of York, he lived to the ripe, improbable, but not impossible age of 98. So, we have a man who, by circumstantial evidence, appears to have been a nobleman living under the assumed identity of Dr John Clement and who may appear in a family portrait as a rightful heir of some kind. There is more that this painting can tell us yet. When compared to the figure beside him, John appears to have very waxy, pale skin, whereas Henry Patterson (More’s fool) has a more natural tone. Leslau tells us that on two well known, well documented occasions, Holbein used the technique of waxy skin to show people at half their true age. This fits with the clock’s suggestion that time has been not only stopped, but also altered. John is marked as ‘Anno 27’. If this is in fact half his true age, he would be 54. Richard, Duke of York’s date of birth in 1473 would make him 54 in 1527, the year to which the portrait appears to refer. I would add as my own observation that the figure of Henry Patterson, More’s fool, bears a striking resemblance to Henry VIII. He also appears to sport a red and white rose, separated, on the top of his hat. Henry also stands just below John in terms of height in the portrait. If the height is used to mark precedence, then the order would appear to be: A missing royal who has just died (Edward V), John (Richard, Duke of York), Henry (Henry VIII). This appears startlingly blatant to me, dangerous for both Holbein and More, particularly if Henry VIII knew who John Clement was, yet perhaps Henry was in on the joke? Level with John’s head is a purple peony, a colour of this flower which apparently does not exist in nature. Purple is a colour denoting royalty, and Paion was the physician to the Greek gods in myth, and a nickname applied to doctors at this time. Hence, the purple peony, an impossible flower, marks a royal doctor. Clement was not made President of the College of Physicians until much later, so perhaps this refers instead to a doctor who is royal? So, Leslau’s conclusions seem to run thus. The painting tells us that there are secrets hidden within it (the sideboard under the carpet). The figure of John represents Dr John Clement, a member of More’s household, husband to his adopted daughter and a person of significance. The household is in mourning for the recent (in 1527, at least) death of a royal. This death entitles John Clement to be addressed as the ‘rightful heir’. The flower selections within the painting are impossible, attracting attention, and point toward royalty, by using purple and gold and fleur-de-lys, and to medicine in the use of the peony. The clock tells us that time has been stopped, even altered, and that this is important, whilst also referencing the House of York. John is shown at half his real age, making him 54 in 1527, the precise age of Richard, Duke of York. Though long, this is a pared down version of Leslau’s complete research. 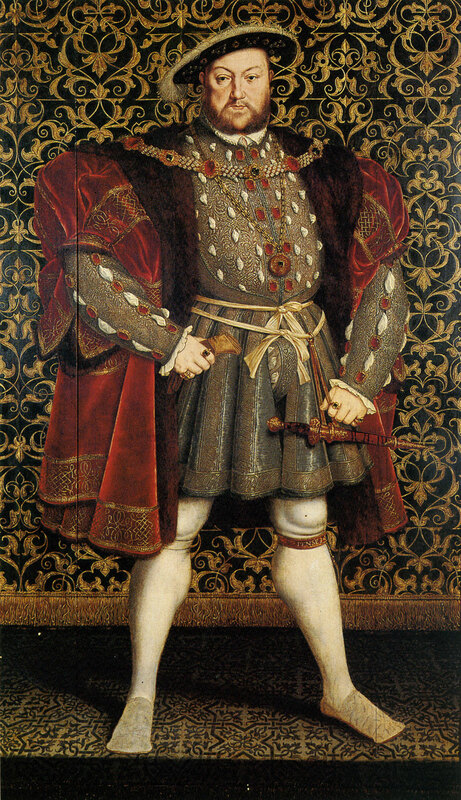 Put simply, Leslau’s conclusion is that the painting contains code that tells us very clearly that Dr John Clement is the assumed identity of Richard of Shrewsbury, Duke of York, younger of the Princes in the Tower, and that both boys lived long into the reign of Henry VIII, the younger surviving until 1572 in the rule of Elizabeth I. It would also appear that the younger lived within the household and under the protection of Sir Thomas More and it is perhaps clear that Henry VIII knew of this fact. Did this contribute to Henry’s growing paranoia and panic as he failed to produce a male heir, then seemed set to die when his only son was a young boy? Was knowledge of this secret the reason Henry could not allow More to live as a private citizen following his resignation as Lord Chancellor? Or is all of this a mere flight of fancy, seeing things because one is looking for them rather than because they are really there? Could a prince live to be 98 years old keeping his existence a secret, even though plenty seemed to know? I don’t know, but given that Richard III is frequently convicted of murder based upon no evidence at all, surely some potential positive evidence in this elusive case must be given due consideration. Of course, that the Princes survived cannot tell us by whose hand this was achieved. Richard III may have laid the foundations that became the arrangements for their incognito existences. It may have been a reaction to Richard III’s defeat at Bosworth. They may also still have been rescued from a plan by Richard to murder them. Some questions cannot be answered by this theory, but perhaps some can. Do you see an answer here? Matthew Lewis is the author of a brief biography of Richard III, A Glimpse of King Richard III along with a brief overview of the Wars of the Roses, A Glimpse of the Wars of the Roses. Matt has two novels available too; Loyalty, the story of King Richard III’s life, and Honour, which follows Francis, Lord Lovell in the aftermath of Bosworth. Matt can also be found on Twitter @mattlewisauthor. King Richard III – Who Said He Killed The Princes In The Tower? This isn’t just meant as posturing. It’s a legitimate question, and an interesting one. The far, far more interesting question, however, is who didn’t say that he did it. This has been called the negative evidence – the conspicuous lack of positive evidence – and it is compelling. It is often reported that the boys disappeared from public view late in the summer of 1483. This appears to be one of the few accepted, undisputed facts in the case. Even at this early stage, their fate was a matter of much gossip and it was, in the main, reported as just that – rumour and gossip. King Richard attracted attention, but so too did the Duke of Buckingham, as the below chronicle shows. The eldest Prince, Edward, was also under the care of his physician, Dr John Argentine. The final glimpse of the boys within the historical record is the doctor’s assertion that “the young king, like a victim prepared for sacrifice, made daily confession because he thought that death was facing him.” This is often taken to mean that Edward feared his uncle was planning to do away with him, but could equally mean that he feared the medical condition he was receiving treatment for may claim his life. It is telling that Edward fears for his life, but makes no mention of his younger brother, Richard. This, for me, is where the historical record becomes most interesting precisely because it is silent. It may be understandable that during the reign of King Richard III he would prefer to have them forgotten, whatever their fate, but he held on to the throne for only two years. After the Battle of Bosworth, King Henry VII ushered in a new, tentative Tudor regime. Had Henry found the boys alive and well, he would have uncovered a real problem. He had sworn to marry their sister, Elizabeth of York, to unite the Houses of York and Lancaster. In order to do this, he had to re-legitimise all of the children of King Edward IV. In doing so, he would hand the strongest claim to the throne in the kingdom to Edward if he were alive. Much of Edward IV’s loyal support, which Henry had co-opted against Richard III, would most likely return their might their former master’s heir. It would therefore be in Henry’s interest for them not to be found alive. Upon taking the throne, Henry VII never once laid the blame for the death of the Princes at King Richard’s feet. In fact, he never laid the blame at anyone’s feet. He never said an official word about them. It would have been so easy for him to state that they were dead, King Richard had done it and now Henry had avenged the evil deed. Odd, then, that he should choose to remain silent about their fate, even during the Perkin Warbeck affair when the spectre of Prince Richard reared its head to threaten him. Fascinating too is the failure of Elizabeth of York during her nearly twenty years as queen consort to put her brother’s fate to bed. She had been in sanctuary in 1483 but the following year rejoined the court of King Richard. If she felt constrained from speaking out at that time, why not condemn her uncle for the murders of her brothers after he was gone and she was free from his control? Surely her new husband would have welcomed any attempt she may have made to blame Richard. Perhaps the most unlikely keeper of the secret was Elizabeth Woodville, queen to King Edward IV and mother to the two lost boys. She too spent over a year in sanctuary with her daughters when Richard stole the throne from her son. She too rejoined his court in 1484, under his protection. In itself, it is strange that she would hand not only herself but all of her remaining children over to a man who had allegedly killed her sons. Yet after 1485, she too would have been free from any threat Richard held over her and who would have had more cause to berate the dead king for his murdering ways? She too said nothing. Eventually she was sent to Bermondsey Abbey in 1487 where she died five years later still never having accused Richard of anything. As an aside, is it possible Henry stripped her of her lands and sent her to Bermondsey because she threatened to produce the boys and oust Henry? Sir James Tyrell is the man most often held to have had the deed done for King Richard, allegedly confessing and offering names when he was arrested for treason in 1502. Examination of the historical record shows that Sir James, in fact, never confessed to the murder, nor was he apparently questioned about it. I have found a reference to Henry VII touting the suggestion of blaming Sir James to an ambassador once, but when it was not well received, he dropped the matter. This account of the boy’s death seems to have firs been formulated by Sir Thomas More in his infamous History of King Richard III. He may have picked up the negative image of Richard during his time in the household of John Morton, Archbishop of Canterbury and perennial thorn in Richard III’s side, yet he too reports only rumour, gossip and that ‘people said’ Richard killed the boys. Even the architect of Richard’s evil reputation could not bring himself to categorically say that he did it. It is interesting too that More never published the work. His nephew completed and published it after Sir Thomas’s death. Did More never mean to condemn Richard? That is a whole other story! The first definite, unequivocal, explicit, unambiguous finger pointing is contained in Shakespeare’s play about the hunchbacked study in evil. Even this, though, presents issues. If we consider the play’s meaning to a contemporary audience, new light is shed upon the bard’s willingness to vilify the last Plantagenet king. Elizabeth I was ageing and had no heir. She was also refusing to name her successor. The play was written around the early 1590’s, when the Queen’s long serving advisor Sir William Cecil was also ageing. His son, Robert Cecil, was being fashioned to take his father’s place. The Cecils were not popular. They were trying to convince Elizabeth to name James VI of Scotland as her heir and this was not a popular policy. The fascinating fact here is that Robert Cecil was, without doubt, a hunchback. Not a man with of scoliosis, a hunchback. Was Shakespeare, then, less concerned with telling his audience exactly who Richard III was and what he did than with providing a moral tale for the country, perhaps even for the Queen, about the perils of relying on a scheming, unpopular hunchback and of failing to secure the succession? It was precisely that uncertainty that had put the Tudor’s on the throne and it now threatened to end their time in power too, sending the country into uncertainty. The joy of writing about this kind of history is that we may never know the entire truth. I may have made wild assumptions, adding two and two together to make ten. Or I may have just hit the nail on the head. It’s interesting though, isn’t it? Matthew is also the author of a brief biography of Richard III, A Glimpse of King Richard III along with a brief overview of the Wars of the Roses, A Glimpse of the Wars of the Roses. Matt’s has two novels available too; Loyalty, the story of King Richard III’s life, and Honour, which follows Francis, Lord Lovell in the aftermath of Bosworth.